Not sure if this was posted elsewhere. "he Long Island Rail Road has reached an agreement with its freight rail operator to replace several high-polluting diesel locomotives with more environmentally friendly locomotives, officials with both agencies said. The agreement follows meetings involving the LIRR, NYAR, elected officials and civic activists who have long raised concerns about the air pollution caused by freight locomotives that NYAR either leases from or has already purchased from the LIRR. The fleet includes five locomotives designated by the Environmental Protection Agency as “Tier 0” for their high diesel pollutant emissions." For NY&A, a good way to clean up the roster with PR20B's and a few switchers(MP-15's,SW1001's). For LIRR,a long overdue replacement of the battle weary work,and "tow truck" Fleet of MP-15's. At the last MTA LIRR Committee meeting the LIRR president indicated that even the locomotives that NYAR purchased would be replaced - the E15's. The LIRR will be buying these engines back from NYAR. Most of the NY&A GP-38-2's(E-20) were leased from LIRR,they were recalled at times by LIRR for work train service,and snow plow duty out east. When the next batch of PR20 B's is online,the GP-38-2's return to Morris Park. A GP-38-2 would be a good mate for LIRR 39 if brought back to the island if OBRM has the room for it. A MP-15 at RMLI Riverhead would be nice,if there's room for it. Gotta love the shady dealings of the MTA, especially since NYAR just rebuilt the MP15's. Someone who ran the newer units said the originally geeps are actually better. Hopefully progress delivers a decent product. THE RFP was pretty much written to see that EMD/Progress gets the deal. One of the requirements stated in the RFP was that the engine must be Caterpillar or Cummins. That pretty much seals it. Correct. The MP15s are not scheduled to be replaced. Once the geeps are replaced by what we hope would be the PR24B, the MP15s will remain in yard service. This is years to come though. How many GATX GP38-2s does the NYAR have and what numbers are they? 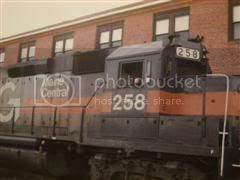 Trainman14 wrote: How many GATX GP38-2s does the NYAR have and what numbers are they?